Continuing in this mini-series on units of the Local Defence Forces (LDF), we now turn to Fawj al-Hadi ("The Hadi Regiment"). Emblem of Fawj al-Hadi. On top: "The army and armed forces: Local Defence Forces." In centre: "The Friends. Fawj al-Hadi. Auxiliary Forces." On bottom: "Homeland, Honour, Sincerity." Fawj al-Hadi was formed on 1 September 2017 by order of al-Sayyid Jawad and al-Hajj Ali Asghar, with a combat mission on the frontlines between Idlib province and north Hama countryside (in particular the al-Ghab region). The objective was to repel insurgent incursions into the government-held parts of the al-Ghab region. After this mission was concluded, Fawj al-Hadi participated in the recapture of al-Mayadeen in eastern Deir az-Zor province from the Islamic State. The next assignment for Fawj al-Hadi was the southeast Idlib offensive in early 2018 that saw the recapture of the Abu al-Dhuhur military airport from the rebels. After the recapture of the airport, Fawj al-Hadi was given the task of protecting it. 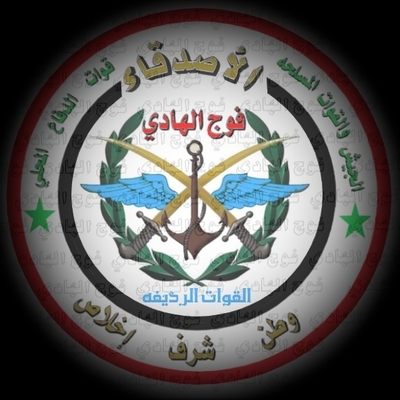 The southeast Idlib military mission was done in coordination with other units such as Fawj Sheikh al-Jabal (also part of the LDF). "And if God supports you, no one can overcome you." Following this mission, Fawj al-Hadi participated in the campaign to recover the north Homs rebel enclave and its environs, capturing Jabal al-Kun in the Jumaqliyah region and the village of Abu Darda, as well as participating in the operations in the Taqsees area. The assignments in the area concluded once reconciliation deals were struck that saw the wider area return to government control. After this mission, Fawj al-Hadi turned to the T2 pumping station area in the Deir az-Zor desert to the southwest of Albukamal near the Syria-Iraq borders. Fawj al-Hadi was tasked with securing and protecting the pumping station area. This included resisting Islamic State attacks coming from the direction of the al-Wa'ar dam towards the T2 pumping station. Fawj al-Hadi successfully resisted those attacks. After this mission, Fawj al-Hadi was tasked with protecting the pumping station's route extending from al-Salihiya area and passing through al-Ma'iziliya all the way up to station. This was its current mission as of late December 2018. - As a whole, the regiment is a battalion (katiba). - Each squadron consists of three groups (fasa'il). - Each group consists of three sub-groups (jama'at). The overall leader of the battalion is Captain Wa'il Jouriya, while each squadron is headed by a lieutenant. Each group is also headed by a lieutenant. As for the Iranians, they provided help for Fawj al-Hadi in a training course in the Palmyra area, as well as organizing taswiyat al-wad' ('regularizing of status') for deserters and those wanted for obligatory and reserve service. Further, the Iranians provided arms assistance for Fawj al-Hadi. Financing matters are managed both by the Iranians and the Syrian army. As with other LDF units, Fawj al-Hadi is an important example of joint work between the Iranians and Syrians on the LDF project.